I served in the Indian Air Force and entered into the teaching profession in 2007 due to my passion and vision to shape students as leaders. I earned my Ph.D. in 2011 and founded MSR Leadership Consultants India in 2007 to provide training programs to educational institutions and corporates. I have become an author in 2010 and published 45 books. One of the books titled Soft Leadership https://www.amazon.com/dp/1628655909 is selling great globally. I was born in Eluru in Andhra Pradesh in India and I currently live in Hyderabad, India. I don’t have any pets. I have been reading books since childhood. I used to observe wall posters and read a lot. I used to read slogans and quotes. I am a voracious reader since my childhood. I started writing in my early twenties when I was serving in the Indian Air Force. I resumed my writing from 2007 after I entered into the teaching profession. Now I am a fulltime author. I read lots of books during my lifetime. After I entered into the teaching profession, I read several books on management and leadership. My favorite authors include Peter Drucker, Marshall Goldsmith, and Dave Ulrich. It is my passion for teaching, training, research, and consultancy that inspires me to write books and articles. 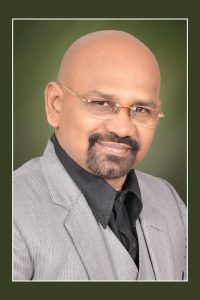 The title of my latest book is: “Soft Leadership: An Innovative Leadership Style to Resolve Conflicts Amicably through Soft Skills and Negotiation Skills to Achieve Global Stability, Peace and Prosperity” URL: https://www.amazon.com/dp/1628655909 This book introduces and explores soft leadership to achieve global stability, security, peace, and prosperity. It explains the causes, effects, and remedies for global conflicts and wars. It draws a blueprint to resolve conflicts amicably. It offers innovative negotiation tools and techniques for soft leaders to resolve conflicts amicably. It illustrates with inspiring examples of great global leaders including Mahatma Gandhi, Martin Luther King Jr., Mother Teresa, and Nelson Mandela. It emphasizes Mahatma Gandhi’s twin principles of truth and non-violence. It implores to replace religion with love to build a better world. It implores to love your mother but don’t hate another person’s mother. This book outlines soft leadership, soft skills, conflict management, negotiation skills, global peace, and prosperity. It serves as a curriculum for global peace studies. It inspires people to grow as global citizens and soft leaders. It is a quick reference guide for scholars and practitioners on leadership, and for learners and leaders to enhance their leadership effectiveness and success. You can easily toss the book into a briefcase, or purse and read here and there as time allows.